Alligator clips are a popular hair accessory similar to a barrette that keep small portions of hair in place. Ranging from just an inch in length for toddler use to 3 inches for adult use, these small, decorative clips offer both fashion and function. Alligator clips can be made of plastic, art glass or metal and are often adorned with bows or decorative elements. If you're looking to update your child's hairstyle with a few well-placed hair accessories, petite alligator clips are easy to use on fussy children. With a simple squeeze, the small clips open at one end like an alligator's mouth for quick placement in the hair. Pull away bangs from your child's face, securing on each side with alligator clips. These clips are also perfect for holding stray hairs around a child's ponytail for a birthday party or special event. 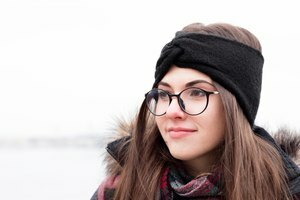 Women with long hair can pull back long bangs with alligator clips for a half-up half-down hairdo. A classic look includes combing several small sections of bangs on the top of the head, securing with a cluster of overlapping alligator clips. Children can choose fun plastic or flower-detailed alligator clips, while adults can pick shiny metal clips. Alligator clips also add style to a bun. 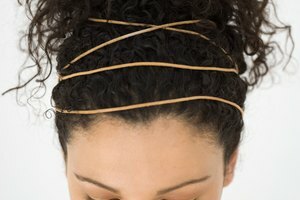 After sweeping hair into a bun, use the clips to secure any strays. 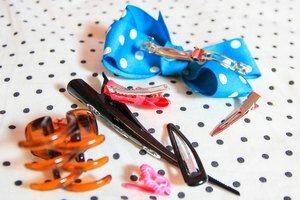 When using several alligator clips at once for a style, choose tiny, 1-inch clips so that you don't overwhelm the look. Since alligator clips are small, they can stylishly secure short hair, too. 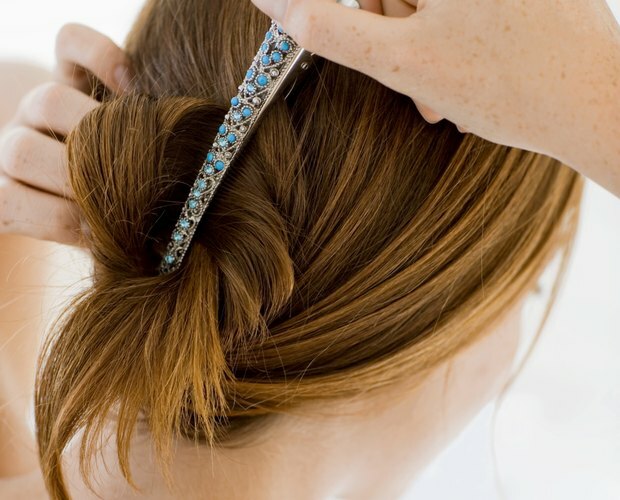 Use the clips to pinch back a small chunk of hair near a side part, for an easy, out-of-your-face hairstyle. Or, you can align three or more elongated alligator clips for a fashionable statement. For example, sandwich a clip with blue rhinestones between two clips with clear stones to accent a blue dress. You can find alligator clips in a wide range of shades and hues that will complement your outfit or blend in with your hair color easily. Small hair accessories are a popular way to add a touch of color or glitter to formal updo hairstyles. Alligator clips with rhinestones, tiny butterflies or silk bows are popular options when accenting a formal hairdo. Secure small hairs near the nape of the neck or around the frame of the face with alligator hair clips in lieu of plain bobby pins. Alligator clips can be placed in the hair quickly with one hand, making them practical when multitasking. Separate layers of hair when using a curling iron with large alligator clips. When preparing to wash your face or apply moisturizer, use alligator clips to hold bangs or stray hairs away from the face. The clips also keep stray hairs at bay when waxing or plucking eyebrows.